The zang zang bao or dirty bun is making its mark (literally) on L.A. The latest food trend from China is transporting us back to childhood, when a chocolate-smeared face meant pure joy. Meet the dirty bun or zang zang bao (“dirty dirty bread”), which has arrived in the San Gabriel Valley. 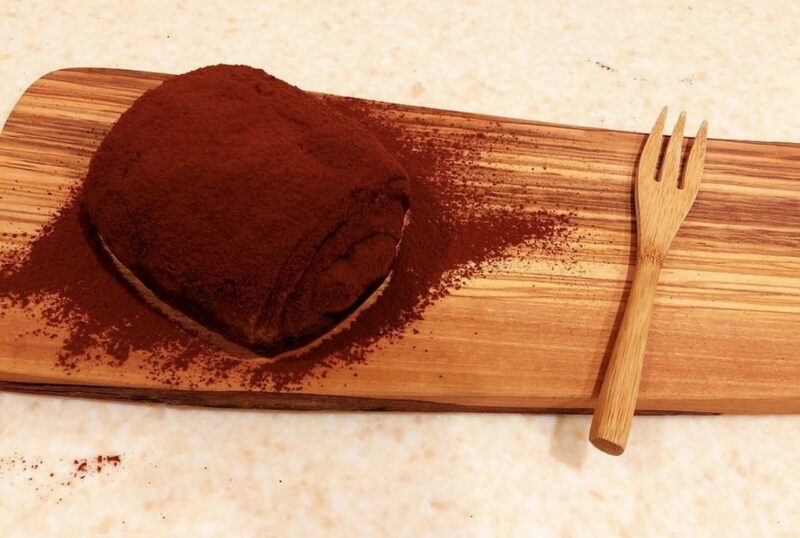 Essentially a chocolate croissant with layers of chocolate icing, chocolate filling, and a cocoa powder coating, the name comes from the fact that the pastry is nearly impossible to eat without leaving you looking like a toddler who broke into the chocolate stash. That’s where social media comes in, and where the saga of the dirty bun goes to another level. Snaps taken of the chocolatey aftermath trended on Weibo (Chinese Twitter). Soon lines akin to those at Howlin Ray’s in Chinatown popped up at bakeries in Beijing and Shanghai that were selling the dirty bun. The trend spread to Taiwan, Malaysia, and Singapore. Now, as with previous food trends from China, it has made its way to the 626. As of right now, we’re only aware of a handful of places to indulge your Augustus Gloop fantasies. Sunmerry, a Taiwanese bakery chain, has SGV outlets at Temple City’s Camellia Square and Atlantic Times Square in Monterey Park, while Puan Sri in Rowland Heights is known for specializing in desserts of the notoriously malodorous durian fruit (so, those with sensitive olfactory organs be forewarned). Sunmerry features a lowered price for two dirty buns, perfect for couples or BFs who want two times the social media content. It should be noted there is no seating at the Temple City location, which isn’t a problem at Atlantic Times Square. Sunmerry also serves a less recent Chinese trend, cheese foam black/green tea, coffee, and lattes. At Puan Sri, one can order a durian foam tea or get a durian coffee, if so inclined. The chocolate dirty bun isn’t on the laminated Puan Sri menu, so be sure to ask. This all comes with the caveat that supply at Puan Sri—an independent store—is limited when compared to a multinational chain. Even Sunmerry might be out of dirty buns, particularly late in the evening or on a weeknight. All of which might mean you make the drive only to discover an empty shelf space next to the sign. Maybe the elusiveness will only make the Messquest more exciting. Sunmerry Bakery, 500 N. Atlantic Blvd., Suite 112, Monterey Park. Sunmerry Bakery, 5728 Rosemead Blvd., Temple City. Puan Sri, 18340 Colima Rd., Suite 1C, Rowland Heights. Next articleCan a Bunch of New Co-Living Complexes Ease L.A.’s Housing Crisis?